Nonduality is the awareness that we are all interconnected. There is no I-You. We are One. And isn't this was Jesus prayed that we would understand? That we are One together with our Source, that is, God? Typically, it's a long, boring drive in which I occupy myself with music and podcasts. Today, however, for the last hour of my drive, I decided to practice mindful driving. I put on some calming music and tried to stay present in the NOW. I succeeded for roughly ten seconds. Immediately, my thoughts jumped to the past or the present and I found myself lost in thought completely unaware of the present scenery, the road in front of me, or the car around me. Mindfulness is hard. Over the next hour, I continued to pull my thoughts back to the now. Grounding myself in the present--what I could hear, see, feel. When I did, I noticed the hundred of geese in flight above the plains. I noticed the ice sparking on the water in the morning sun. The feel of the wheel in my hands. The hawks resting on the road signs. The feel of the earth and the energy of the morning. I felt connected to the plains--even as I went speeding passed. And like the trees clustered together along the riverbanks, I had the profound feeling that I was connected to nature and to the spirit of the land. Even though I was alone on the long stretch of Kansas back road, I felt surrounded by thousands. I call them my "witnesses" (also what the Bible calls them)--the "great cloud" of spiritual guides that we all have at a moment's notice for encouragement, guidance, and love. Truly, past, present, and future, we are all connected. 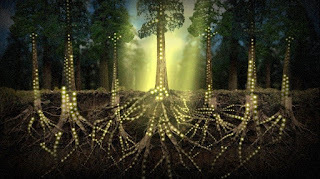 Our roots are intertwined in the deep earth of humanity. The individuals that have gone before me are with me now. For me, this was an easy thing to accept. My ancestors? Sure. I can feel their presence and still hear their words. The more difficult awareness is that those in my life currently are also interconnected with me. These individuals that I will be seeing at the psychiatric hospital? They are also a part of my story. They are a part of me. Their fear, pain, and chaos is also my own. This peace that I now feel in this moment of mindfulness will be what I carry to them. The anger and frustration that I so often feel toward them is my personal frustration at my own humanity. The love that I carry with me is God's work of healing in our interwoven roots of humanity. I am them. What if I truly believed this? How much would it impact my work? How much would it impact my every movement in the world? Did Jesus not say- love your neighbor as yourself? Why? Because my neighbor is me. Non-duality. We are not two, we are one. We are all connected in our Divine Source. What a beautiful, profound thing this is.